Astrophotographer Chris Schur captured this view of Comet 41P/Tuttle-Giacobini-Kresák on March 23, 2017 using a 10-inch Orion Astrograph telescope. A bright-green comet will make its closest approach to Earth tonight (March 31 to April 1). Though some people are calling it the "April Fools' comet," this is no joke. You can watch the comet's close approach in a live web broadcast from Slooh's online observatory tonight. Slooh astronomers will point their telescopes at Comet 41P/Tuttle-Giacobini-Kresák today (March 31) beginning at 8:30 p.m. EDT (0030 GMT on April 1). You can watch the webcast live on Slooh.com. The comet's closest approach will occur at 8:34 p.m. EDT (0034 GMT on April 1) and will bring it to a distance of 14 million miles (22 million kilometers) from Earth. With a small telescope or a good pair of binoculars, you can see it for yourself — or you can enjoy the view from Slooh's telescopes in the Canary Islands. "Take a break from a day of pranks and jokes and enjoy a coverage of a comet that only travels around the sun every 5.5 years," Slooh representatives said in a statement. "This closest approach will be the closest encounter with Earth for over a century." 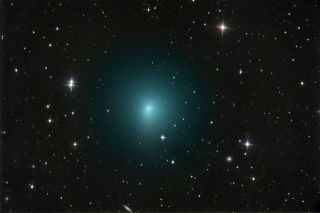 Editor's note: If you capture an amazing photo of Comet 41P/Tuttle-Giacobini-Kresák through a telescope and you would like to share it with Space.com, send images and comments in to spacephotos@space.com.